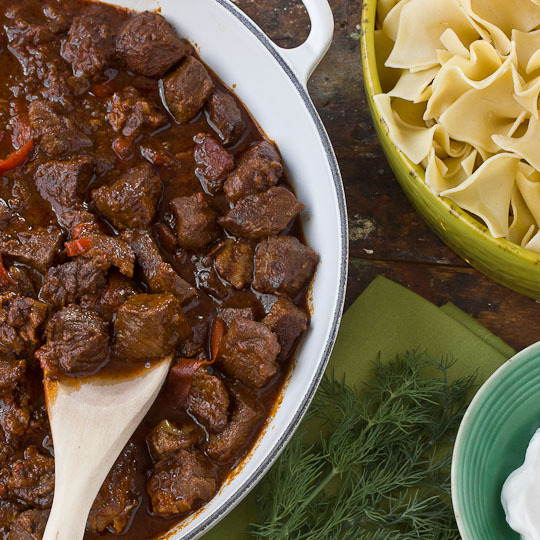 I grew up without ever tasting real goulash. My mother made something she called goulash that was a mix of elbow macaroni, hamburger and tomato sauce. As a child I just assumed it was the real deal, but as I got older I realized the dish wasn't even close to the flavour treat of a real Hungarian Goulash. Over the years I kept meaning to find a recipe to try, but never quite followed through until last month when I stumbled over the recipe below. It looked wonderfully flavourful and I felt it perhaps might be at least a bit traditional from the comments. The recipe wasn't a quick fix, tailored to fix our busy lifestyle - it had several steps, real spices and red wine. It looked much more authentic than others I had seen in the past. It was time to take the plunge. So last month I wrote out the long shopping list of ingredients required and headed out to the store. An afternoon of cooking later this recipe was labeled a keeper by my family. I also liked it, but think some adjusting is in order to make it more my own. The broth didn't cook down as much as I would have expected and I think I want to fill out the flavour a little. I will have to try it again and may have to look at a few more recipes before I settle on how to fine tune this one. Only then will it become a family staple. For now I am including the recipe in it's original form. The only real difficulty for me was finding real, fresh Hungarian Paprika. Even the local Galloways was out of stock. So before you take the plunge, be sure you can get this important ingredient. I did a little research on the subject of paprika. It was interesting to find there are 8 grades of the Hungarian from mild to hot. My family is really mixed on the heat issue, so I was sure to go with a mild version. If you're interested, I would check out this article - What's the Difference? Paprika. One substitute I found locally that I tried and seemed okay was La Chinata at Save-on Foods that is a similar sweet, mild paprika only from Spain. Note - I thought I originally saw this in an article in the Vancouver Sun, but couldn't find the link so I could confirm where is originally came from. 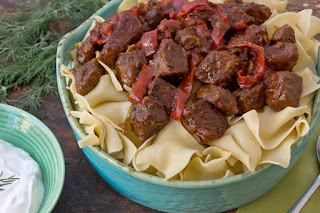 In an internet search I found the exact recipe and images at The Kitchen in an article by Nealey Dozier of Dixie Caviar titled - Late Winter Recipe: Beef Goulash. I don't know if it was picked up on a wire service and did appear in my local paper or not, but I am sure I didn't find it on this website first. Definitely a mystery and one I will perhaps never solve. Cut beef into 1-inch cubes. (You can place the meat in the freezer for thirty to forty minutes to make make it easier to cut. Just allow it to come to room temperature before cooking.) Thoroughly pat dry with paper towels and season generously with kosher salt and pepper. Heat a large Dutch oven over medium-high heat. Add the bacon and fry until crisp and golden, about 7-9 minutes. Remove the bacon with a slotted spoon, leaving the remaining fat in the pot, and set aside. Add 1/3 of the beef cubes to the bacon fat (do not stir or disturb the meat) and cook until the bottoms are seared and deep golden brown (almost black), about 3-5 minutes. Turn beef and continue cooking until remaining sides are browned, another 3-5 minutes. Remove the beef to a separate bowl. Allow the fat in the pan to reheat for a minute or so (and to cook out any residual meat juices before continuing. Add the next 1/3 of beef and a glug or two of oil if the pot seems dry. Repeat the searing process until all the meat is browned and set the bowl aside. Lower the heat to medium and add a couple tablespoons oil. Add the onions and sauté, stirring occasionally, until soft and golden, about 8-10 minutes. Add the garlic and caraway seeds and sauté for another minute or so. Stir in the paprika, tomato paste, and marjoram until combined. Pour in the wine and increase heat to high. Scrape the bottom of the pot with a wooden spoon to remove any leftover browned bits. Add stocks, browned beef, and reserved bacon to the pot and bring mixture to a boil. Cover and transfer to oven. Cook for 1 hour, then stir in the bell peppers. Return to the oven and continue cooking until the meat is quite tender, another 45 minutes to an hour. Season with salt and pepper to taste. Ladle over cooked egg noodles, and serve with a big dollop of sour cream and a sprig of fresh dill. This recipe is even better made a day or two in advance. Just reheat in the same Dutch oven over medium-low to medium until warmed through.